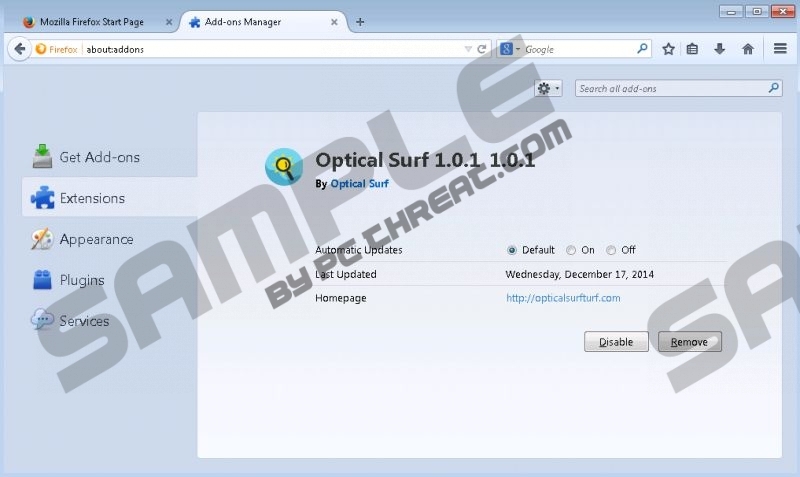 Optical Surf is supposed to be a piece of the best web browsing technology, as this is how the application is presented at opticalsurfturf.com. Of course, this program is not as great as users are made to believe. In fact, there is no reason why you should install this program at all, and if you have done this already, it is best to delete it. Do you believe that the application will produce authentic offers? Unfortunately, it will not, and so you should not postpone the removal of Optical Surf for much longer. If you install Optical Surf onto your operating system, it will display the ads and offers presented via suspicious adware servers. These ads are the reason why you need to delete Optical Surf from your PC, because various security backdoors could be opened up using them. For example, the adware server could present an ad that links you to a site promoting unreliable software installers. These installers could be used to download malware. If you remove Optical Surf, the unreliable ads will no longer be presented. Even though it is likely that the "Provided by Optical Surf" and "Ads by Optical Surf" offers will disappear from your browsers as soon as you delete Optical Surf, other kinds of ads may keep showing up. This may happen in those cases when Optical Surf gets installed onto the targeted PCs bundled with adware. If you do not need to delete the advertisement-supported programs that enter your PC packaged with Optical Surf, it is possible that you will need to remove potentially unwanted programs, tracking cookies, adware helpers, and other unreliable programs. Note that your virtual security may depend on the successful removal of these programs. The developer of Optical Surf is SuperWeb LLC, and our researchers warn that this company does not take much responsibility for the distribution of the advertisement-supported program. Zap Tilla, Digi Docket, Byte Label, Ace Race, and other apps that are identical to Optical Surf are not directly distributed by the company. Instead, they are spread by suspicious third parties. Therefore, it is impossible to predict what other apps may be installed alongside, and what kind of removal operations you may need to perform. If you uninstall Optical Surf from your PC using the Add or Remove Programs or Uninstall a Program utilities found on your Windows operating system, it is most likely that you will delete the suspicious program together with all of its components. However, it may be difficult to delete the remaining threats, and so we advise installing the automatic malware removal software. Open the Start menu by clicking the Start icon on the Taskbar. Open the Start menu by clicking the Windows icon on the Taskbar. Quick & tested solution for Optical Surf removal.